What better gift on the day of a Christening than this high quality KJV Bible? With a decorative box, binded with gold foil and with gold edged pages this really is a gift Bible to last a lifetime. 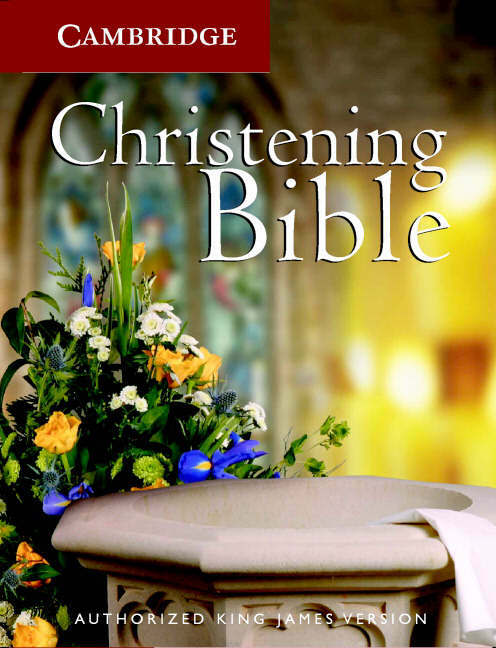 This KJV Bible has been designed as a gift for a christening and contains a presentation slip or certificate so that the buyer can inscribe the details of the event. The book is a tiny volume, small enough to fit in a child's hand; yet the text is still clear and sharp. The Bible uses the traditional King James Version, or Authorized Version, the translation so often requested for ceremonial events; and includes both Old and New Testaments. It is packaged in a decorative box showing a baptismal font in a church. KJV Christening Bible: White, Imitation Leather was published by Cambridge University Press in April 2004 and is our 14719th best seller. The ISBN for KJV Christening Bible: White, Imitation Leather is 9780521600910. Be the first to review KJV Christening Bible: White, Imitation Leather! Got a question? No problem! Just click here to ask us about KJV Christening Bible: White, Imitation Leather.